This represents my path to creative exploration. 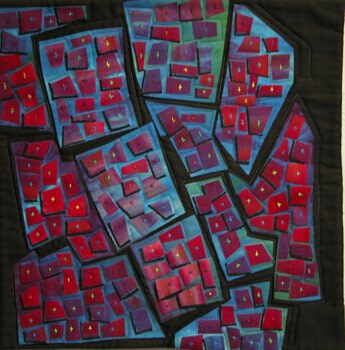 I fused hand-dyed fabrics onto black cotton and embellished each stone with brightly hand-dyed pearl cottons; all dyed by Laura Wasilowski, whose fused techniques inspired me. I used variegated cotton threads to machine quilt the piece.